Bad Dog Theatre Company is excited to announce the return of our diversity and inclusion conference! Year three of Our Cities on our Stages will take place on at CSI Bathurst on Saturday, June 2 and Sunday, June 3 and will explore the theme of Developing the Next Generation of Leaders. On offer all weekend: workshops, presentations, and discussion panels led by diversity and inclusivity thought-leaders - from within the unscripted comedy sector as well as neighbouring artforms facing similar challenges. The first two years of OCOOS were broadly themed around best practises in Inclusion and Diversity. In its third year, OCOOS hopes to delve deeper into one specific question that arose out of prior years, namely: how do we foster diverse and inclusive leadership moving forward? How do we help provide access, training, and space to ensure that the future leaders are supported in their endeavours? On Day One of OCOOS a panel of improv institutions will share the Inclusion related successes and challenges from the last year. We will then hear from grassroots producers and YOU, the symposium participants: what’s working? What is missing? What can be improved? On both Day One and Day Two of OCCOS we are offering public workshops designed to help participants hone in on practical knowledge in their area of interest. Finally, on Day Two we will conclude with a Design Jam for educators to help address issues of accessibility in the classroom. WHAT IF I CAN'T BE THERE FOR THE FULL EVENT? No problem! We totally understand, drop in and out as you need! Are you an improviser? A student of improv? A teacher of improv? A producer? An administrator? A person? Our Cities on Our Stages is for you. 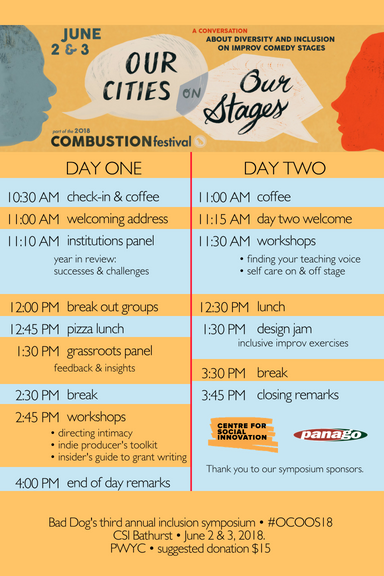 The overarching goal of this symposium is for our improv/comedy stages & communities to better reflect the cities we live in. We won't solve that in two days… but our hope is that all of our core collaborators will walk away with actionable ideas, expanded support networks, and better sense of their community. The event is sponsored by the Centre for Social Innovation is held at CSI Annex 720, which is an accessible venue.